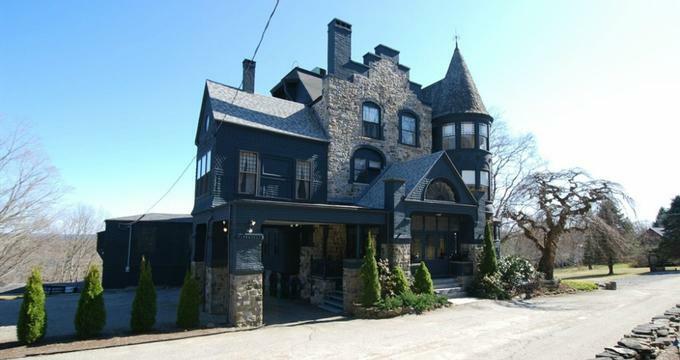 Set in a historic 1886 stone castle, the Norumbega Inn in Camden, ME is a luxurious bed and breakfast that offers elegant accommodations with fireplaces and private balconies with water views, modern amenities, and sumptuous cuisine. Located in the heart of beautiful mid-coast Maine, this iconic landmark is a short walk from the beach and close to various attractions in the area like the Farnsworth Art Museum and the Camden Hills State Park. Beautifully appointed guest rooms have en-suite bathrooms and private balconies, while deluxe suites boast separate living areas with pull-out sofas and/or fridges, whirlpool or claw-foot tubs, and stunning views. Guests are treated to a delicious hot breakfast every morning and have use of the hotel’s facilities such as a fine-dining restaurant, a fully-stocked library and several communal decks with outdoor seating and breathtaking panoramic vistas. The Norumbega Inn features 11 beautifully appointed guest rooms, two of which are luxury suites. All accommodations have comfortable king-size beds in luxury linens, en-suite bathrooms with walk-in showers, claw-foot tubs, thick towels and bathrobes, and Antica Farmacista bath products. Living areas have comfy armchairs and seating, gas fireplaces and air-conditioning in season, while suites offer separate living areas with plush pull-put sofas, armchairs, and mini fridges. Shared or private terraces have outdoor seating and provide spectacular water views, and modern amenities abound, including flat screen televisions with cable channels, Bluetooth wireless speaker systems, irons and ironing boards, hairdryers, and complimentary wireless Internet. The Library Suite is an enchanting two-room suite situated in what was once the castle's original library and features an upper balcony of hand-carved mahogany, a king-size bed (can be converted into two twin beds) with deluxe linens, and breathtaking harbor views. An en-suite bathroom offers a bath/shower combination, thick towels and bathrobes, and Antica Farmacista bath products, and a cozy sitting room has a gas fireplace and comfortable pull-out sofa for relaxing and hosting additional guests. The Penthouse Suite is Norumbega’s most luxurious room with spectacular panoramic views of the bay from the top floor of the castle. The suite has a spacious living area with pull-out sofa and comfortable armchairs, a mini-fridge stocked with soda and water and a gas fireplace. The bedroom boasts a king-size bed dressed in luxury linens, an en-suite bathroom with a marble shower and oversized oval soaking tub, thick towels and bathrobes, and Antica Farmacista bath products. Modern amenities include a flat screen television with cable channels, Bluetooth wireless speaker system, iron and ironing board, hairdryer, and complimentary wireless Internet. A complimentary three-course hot breakfast is served every morning in the elegant dining room and includes a variety of warm made-to-order dishes, along with fresh fruit and juices, freshly baked goodies and hot coffee and tea. Optional dinner is available with a seven-course chef’s tasting menu offered on Thursday and Saturday evenings. Alternatively, the hotel’s fine dining restaurant is open for guests to enjoy at the leisure. The hotel also hosts exclusive dinner events for special occasions such as anniversaries, weddings and other gatherings. Deluxe amenities at the Norumbega Inn include several communal spaces for guests to enjoy such as a central living room, an elegant sitting room, a fully stocked library, a 'couples' landing and the Inn’s beautiful dining room, where breakfast is served every morning. The Inn is surrounded by four acres of exquisitely manicured gardens and has several outdoor decks with seating where guests can relax and soak up the magnificent views. A fine dining restaurant serves award-winning cuisine, including seven-course chef’s tasting menu on Thursday and Saturday evenings and catering for special events. The Norumbega Inn is ideally located for exploring Camden and its many attractions and activities, such as the Camden State Hills Park, the Farnsworth Art Museum, and the Penobscot Marine Museum. Other attractions include the Owls Head Transportation Museum, the Merryspring Nature Center, and the Center for Maine Contemporary Art. The Norumbega Inn caters for special events such as weddings, receptions, and anniversaries, with the full use of the inn, including overnight accommodation, amenities and facilities, and sumptuous cuisine. Receptions can be held indoors for up to 50 guests or outside on the lawn for up to 100 guests, and customized menus and catering services are available from the Inn’s award-winning chef.